The grasses are tall in deserted gardens. Has it gained any favor of dews and raindrops? But it never changes loyalty for the sun. As a commonest while most popular special snack, sunflower seeds are welcome to almost everybody in the world. There are always many people cracking them in many parts of the world at any time of the day. Sunflower is a member of the composite family. It was originally a discovery by Christopher Columbus when he landed on the New Continent, because there was no record about it before that time in the world. In the early 16th century, the Spaniards found that the mountain slopes in Peru and Mexico were covered by sunflowers when they got on the shores. They found that the new plant had large and thick leaves, and a golden plate on top of them. The Spanish sailors regarded them as �holy flowers created by God�, and took some back to Europe as ornamental flowers. 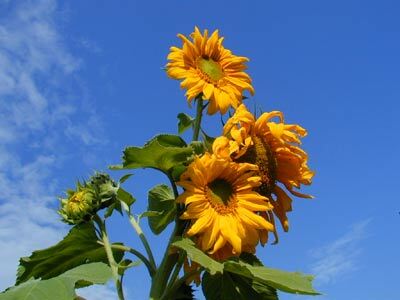 The plant gets its formal name �Helianthus�, which means �flower of the sun�, because its flower plate always turns toward the sun. As a matter of fact, this is simply the tropic movement of certain plants. The growth hormone at the end of the plant stalk is not evenly distributed because the stimulation of the sunlight in one direction. The side facing the sun has less hormone, and the side in poor light has more growth hormone; therefore, the side facing the sun grows slowly, and the side in poor light grows very quickly. That�s why sunflowers always turn to the sunlight. Just because of this, the Russian people who love brightness all favor sunflowers, and elect the sunflower as their national flower. However, when one is cracking the sunflower seeds happily and joyously, has he or she ever imagined that there was a sad story about the sunflower. Long, long ago, there was a country girl named Minggu. She was kind-hearted, na�ve, beautiful and clever. Her mother died when she was still very young, and her cruel stepmother maltreated her by all manner of means. One day, she talked back to her stepmother for a trivial matter. Her stepmother was very angry and lashed her with a leather-thonged whip. However, her stepmother lashed her own daughter by accident, so she became angrier. During the night, the stepmother scooped her eyeballs out when she was still in sound sleep. The pain was unbearable. Minggu ran out of her home to escape, but unluckily, she died soon. Later, a new plant grew out of her tomb and it had golden flowers that are as big as plates. It always turns towards the sun. This plant is the sunflower of today. Until today, this story is still encouraging people to fight against darkness and to pursue brightness. The sunflower not only has its native land in Peru, it is also the national flower of Peru. There is also a story about this: the Inca Indians originated from the island where the God of Sun lived in a lake. The God created a woman and a man, and let them become wife and husband. The couple had many sons and grandsons, and later their offspring became a new tribe. The God of Sun ordered them to immigrate to a new place for the sake of further development. The name of the tribe -�Inca�- means �the offspring of the sun�. The Indians of that time call the sunflower the flower of the sun, so the people of Peru elect it as their national flower.